To mark the arrival of The Criterion Collection’s new edition of Wim Wenders’ film Wings of Desire, Response asked two moviegoers to share perspectives informed by their areas of expertise: a filmmaker and a theologian. For both of them, it’s important to note that the movie isn’t just about angels, wonder, and love. It is, above all, about Berlin. Scott Derrickson, the director of The Day the Earth Stood Still and The Exorcism of Emily Rose, has collaborated with Wenders before. He wrote a film called Land of Plenty, which Wenders directed, and which featured Michelle Williams (Wendy and Lucy) in a leading role. He explains, “For American moviegoers, the question of the Berlin Wall is a question of whether Communism is what is preventing people from seeing God — once the wall fell, would we see an explosion of Christian conversion? Unfortunately, what has been seen in Europe has not been a run for churches, but a run for the shopping mall. What makes Wings of Desire so timely for us in the first decade of the 21st century is that we are now watching not communism faith … but capitalism. And still the same question — Is the world God-filled, or God-bereft? — remains." Keuss says the film brings to mind the prophet Zechariah. Zechariah was writing to Israel after their captivity in Babylon, and their release by King Cyrus to return to Jerusalem. "An entire generation had been raised to hear about the promise of Israel but never seen it," he explains. "Upon finally returning to this promised land, the holy temple and the city laid in ruin after a generation of clans had picked over the remains in the decades of desertion. Zechariah is charged with rebuilding this city as the new Jerusalem and has a series of ‘night visions’ that give an apocalyptic promise to what Jerusalem will ultimately become." Certainly the people of Berlin in the film have been persecuted and they feel far from "the promised land." How does Wings of Desire speak to this oppression? 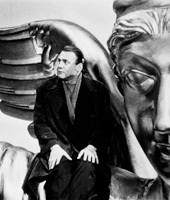 Editor's Note: Read Part One about Wings of Desire. Check out other Response exclusives.